In an effort to offer their clients a greater understanding of how LED video can transform an environment, LED video manufacturer PixelFLEX has formed a partnership with SpaceView. As an augmented reality (AR) technology, SpaceView transforms the way commercial construction and renovation design teams collaborate and visualize their creations by providing near-instantaneous and accurate product installation renderings. 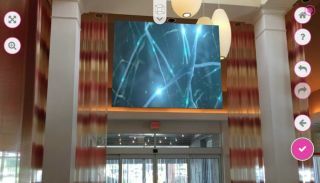 Operating across all Apple, Android, and Microsoft OS platforms, PixelFLEX customers will now be able to virtually experience their LED video creation in true scale with the simple drag and drop of a photo. In addition to applications for Apple, Android, and Windows smartphones and tablets, SpaceView is beginning development for Microsoft HoloLens and the Oculus Rift technology platforms. For more information on the SpaceView Augmented Reality technology now in use by Nashville-based PixelFLEX, visit Space.vu.